Today His Imperial Majesty celebrates his 78th birthday. By Japanese standards that's small potatoes, nothing special. He's only 78. Mr T's grandma is 93. Or maybe 94. Sorry, I've lost count. But she's just a grandma, and Akihito is the Emperor of Japan, and there's one serious difference here. And I'm not talking about their age. The Imperial Birthday is an official public holiday in Japan and that means that instead of getting up at 5:30AM, today I could sleep until 6. Then the cats woke me up anyway. They were hungry and didn't care much for the fact that it was my day off. But since it was my day off (thank you so much, Your Imperial Majesty! ), Mr and I went downtown to do some last minute holiday shopping. No, not really. I was shopping and he was walking around taking photos. And it wasn't holiday shopping, either. I had to use my Kinokuniya points before they expire at the end of the year. So how I ended up with Peach Body Butter from Body Shop is a total mystery to me. I did manage to get a couple of books, too. But back to Akihito and his birthday. We've walked on the street leading from City Hall to Parco hundreds of times. We normally park at City Hall, because the municipal lots there are free and open even during weekends and public holidays. And we've passed by the tiny Kotohira shrine tucked between some wholly unremarkable buildings hundreds of times, too. Last January we even peeked inside and took a couple of photos. Nothing special. So what made us stop by there today? No idea. But we did. We went through the gate and looked around and we spotted this. Today! Of all the 365 days in a year, we noticed it today. A marvelous coincidence, if you ask me. 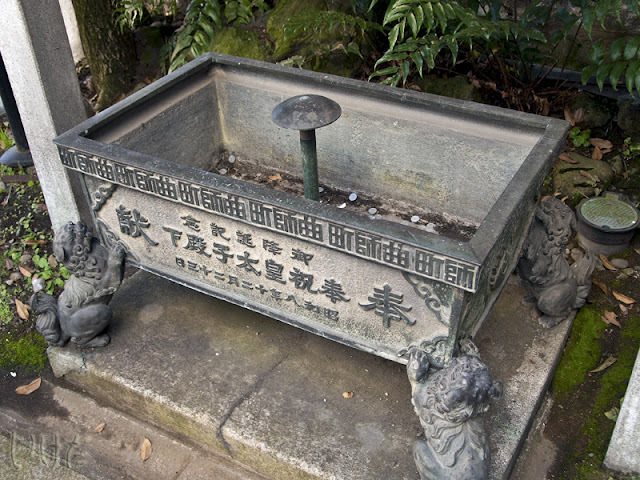 In 1933, to mark the birth of the imperial baby (and back then the imperial family was still very much "godly") Mageshi-cho presented this inscribed fountain to the shrine. 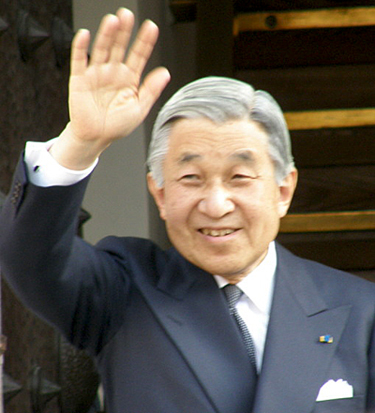 And now that baby is no longer a prince, but the Emperor of Japan. 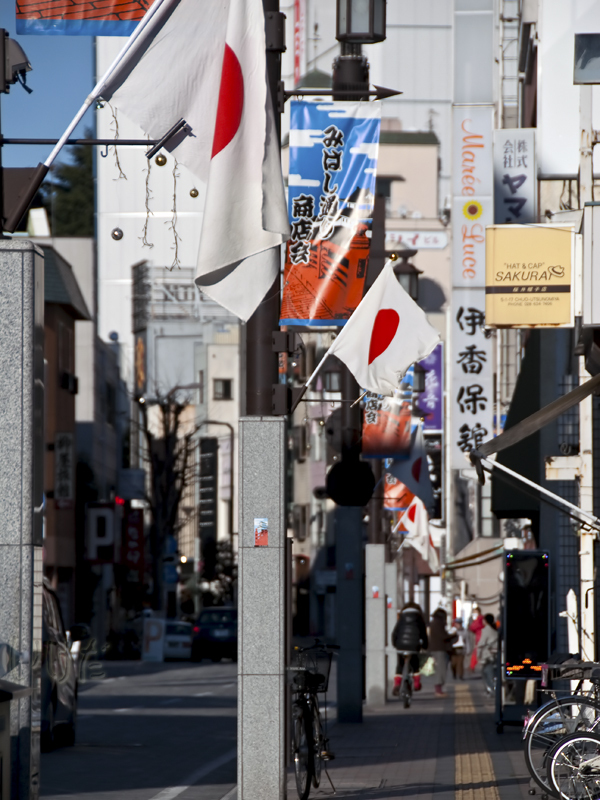 And to mark his birthday, the streets were lined with flags. I was surprised to see that a significant number of private homes also had flags outside. I guess I wasn't paying much attention in previous years. We used to fly a flag when we lived abroad, but somehow Mr T's national pride is a lot weaker in his homeland. Or simply, he doesn't want to ruin the exterior of our new house with a flag holder that's gotta be either nailed or screwed in. Oh well... No flag for us. I'd probably forget to bring it in before sundown anyway. So yes, Happy Birthday, Your Imperial Majesty!